"The biggest problem we face in this country is political correctness. Everyone's being so damn careful not to offend anyone; it's a bunch of crap." "BORAT! is nothing but a totally offensive piece of crap. I'm not going to waste my money." The above two quotes were heard recently at lunch -- within minutes of one another. Yes, they were spoken by the same individual. As Borat might say, some people could use a little "cultural learnings for make benefit glorious tolerance among crackers." One can only hope. 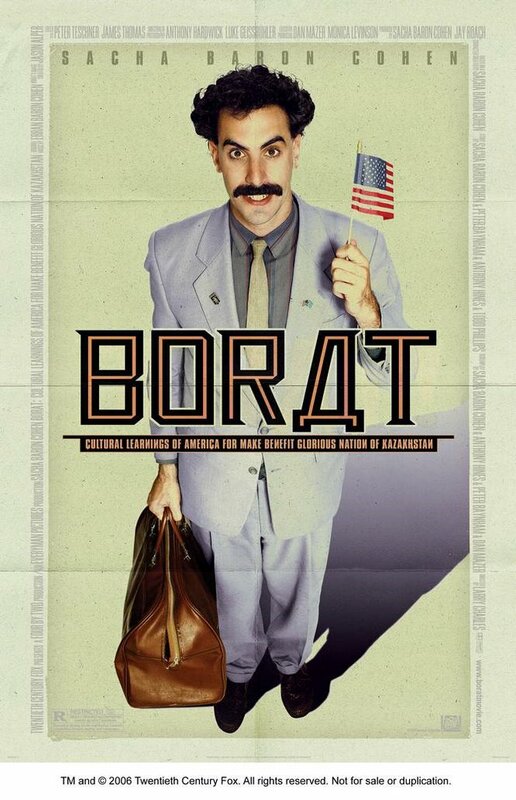 Starring Sacha Baron Cohen, BORAT! is essentially a road movie. As far from ROAD TO RIO or ROAD TO ZANZIBAR as one can possibly get, the road taken here is populated with polemic potholes, ranging from anti-Semitism, misogyny, homophobia, bigotry, racism, cultural elitism and religious fervor. Heady stuff, indeed, yet I cannot help but believe that even Bob Hope and Bing Crosby would appreciate this journey --- because while Borat Sagdiyev entertains, Sacha Baron Cohen enlightens. My recommendation is to go see for yourself why BORAT!CULTURAL LEARNINGS OF AMERICA FOR MAKE BENEFIT GLORIOUS NATION OF KAZAKHSTAN is a box-office hit. Go on, just do it. (Here's one hint: It has nothing to do with the fact that the title is the second longest in American cinema history -- DR. STRANGELOVE OR: HOW I LEARNED TO STOP WORRYING AND LOVE THE BOMB -- remains the record holder by one word). True, you may find yourself offended a time or two. So what? Perhaps David Edwards of the Daily Mirror said it best: "The least politically-correct film since THE TRIUMPH OF THE WILL." Just what America needs -- or so I've been told.